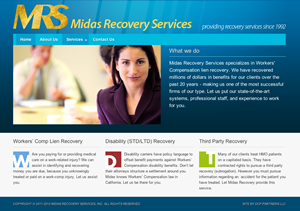 We recently released an all-new website for Midas Recovery Services. MRS President Paul Leahy and Manager Wendy Payton wanted an updated look and feel to their web presence that they could update and manage themselves. We created a new design and implemented a simple WordPress system that provides the CMS functions they were looking for. In addition to static Pages that describe their services, a simple contact form makes it easy for visitors to get more information. Its a simple design that provides a solid foundation for the future – without breaking the bank.